Almost all the parts of a pair of jeans can be used in recycled crafts. 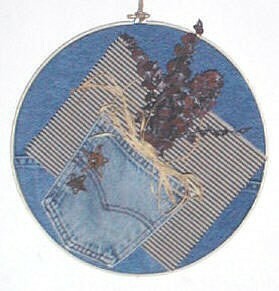 This is a guide about jean pocket crafts. This is a purse I made for my 7 year old daughter and her friend. I used an old pocket from my husband's old jeans. Carefully cut right along the edge of the pocket. You can use "Fray-Check" on the sides to keep it from raveling later. This craft is easy and very versatile. Cut 1/2 inch around a blue jean pocket with a pinking shears. Attach a ribbon or shoelace to each top side of the pocket for a hanger. Fill with a pen, pad of paper and some markers. These are great for the car and hanging near the phone. Enjoy! Create a pocket on a notebook to hold pens, pencils, notepads, etc. Kids will enjoy personalizing the pockets. 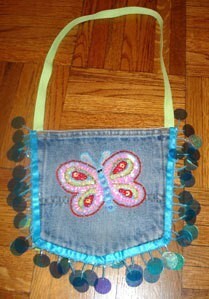 A great way to recycle old jeans/pants pockets too! appliques, buttons, foam shapes, etc. 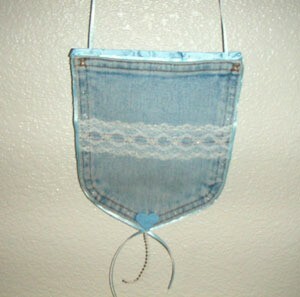 Cut the back pocket from a pair of old jeans or pants. 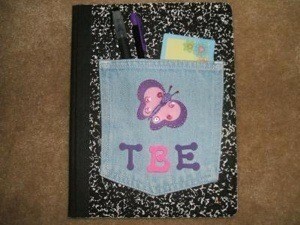 Decorate the pocket as desired by gluing on appliques, foam letters, etc. Using hot glue gun, run a bead of glue along sides and bottom of pocket, leaving only the top open. Press pocket into place on notebook. Fill with supplies such as pens, pencils, erasers, notepads, etc. A lot of fun. First, paint your heart. I painted the wood heart to match with acrylic paint. While it dries you, can cut out your pocket. Turn your old torn jeans into a wreath. Make sure to cut the pockets out, they really can add to a wreath.